Sure, there are plenty of beauty products that help you achieve great hair and skin, and a lot of other tricks for product-free skincare, but the fact of the matter is that eating well is one of the best changes you can make to look your best, day in and day out. With that in mind, we’ve assembled a list of the key building blocks you can introduce into your diet for seamlessly stunning skin and hair. Yes, there are plenty of “superfoods” that have eclipsed blueberries in recent years, but ultimately these low-key berries are still the #1 source of age-defying antioxidants out there. Bake with them, blend them into a smoothie or just snack on them straight up and you’ll be getting a leg up on those harmful free radicals. The key here is that the salmon is wild-caught, since farmed fish has markedly lower levels of heart-healthy omega-3 fatty acids. Not only do these omega-3s contribute to moisturizing your skin and hair, wild salmon also contains selenium, which contributes to your skin’s natural defense against sun exposure. 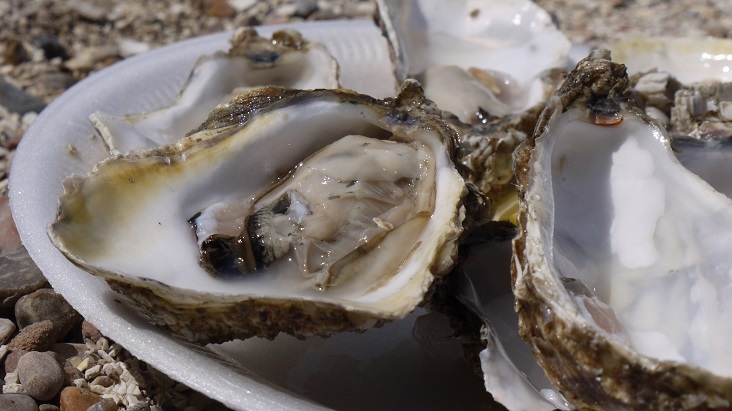 Most people know the ancient adage that oysters are aphrodisiacs, but the fact is they’re so much more. Loaded with zinc, they help in the repair of skin cells and speed their renewal — a key to better-looking skin. As a bonus, zinc also keeps your hair, nails and eyes at their best. So next time you’re enjoying a happy hour with friends, order some oysters and feel good about all the benefits you’re getting. Though almost any nut has benefits for your hair and skin, walnuts are far and away your best option. They’re loaded with those amazing omega-3s mentioned above and include the added benefit of a ton of vitamin E, which is not only great for your skin but a key ingredient in getting naturally shiny, soft hair. Loaded with beta-carotene, spinach is the ultimate foundation for a beauty-boosting meal. Its nutritional makeup is tailored to helping your skin retain moisture and reducing the appearance of wrinkles. To get the maximum benefit, make sure to pair your meal with something high in vitamin C, which will assist in nutrient absorption. One of our favorites on this list, dark chocolate is loaded with antioxidants to help keep your skin looking young. The key here is to avoid products with loads of added sugar; instead, opt for bars with a minimum of 75% cocoa in order to maximize the benefits. If you’re used to the sweet stuff, this will take getting used to, so look for bars with natural flavors like mint, lavender or sea salt to help develop a taste for it. Oats are one of the best foods out there for healthy hair due to their composition of zinc, biotin, magnesium and potassium. All these ingredients work together to help strengthen your hair from root to tip, which is especially important if your hairstyle requires stress-inducing dyeing, blow-drying or other treatments. For the ultimate skin- and hair-healthy breakfast, throw some fresh blueberries and walnuts on top. This is a truly unique substance because not only can you substitute coconut oil into almost any recipe where oil, butter or other fat is required, you can also use it straight up as a natural skin or haircare product. Loaded with vitamins E and K, you can use it as a standalone moisturizer for your skin and scalp (avoid your face if you have blemish-prone skin). Best of all? You’ll basically smell like cookies when you do.